Born in 1951 in New York, Ian entered the American folk music scene while still a teenager in the mid-1960s. Most active musically in that decade and the 1970s, she has continued recording into the 21st century. She has won two Grammy Awards, the first in 1975 for "At Seventeen" and the second in 2013 for Best Spoken Word Album, for her autobiography, Society's Child, with a total of ten nominations in eight different categories. Born in New York City, Janis Fink was primarily raised in New Jersey, initially on a farm, and attended East Orange High School in East Orange, New Jersey and the New York City High School of Music & Art. Her parents, Victor, a music teacher, and Pearl ran a summer camp in upstate New York. At the age of 14, Ian wrote and recorded her first hit single, "Society's Child (Baby I've Been Thinking)", about an interracial romance forbidden by a girl's mother and frowned upon by her peers and teachers. Produced by George "Shadow" Morton and released three times from 1965 to 1967, "Society's Child" became a national hit upon its third release after Leonard Bernstein featured it in a CBS TV special titled Inside Pop: The Rock Revolution. At age 16, Ian met comedian Bill Cosby backstage at a Smothers Brothers show where she was promoting Society's Child. Since Ian was underage, she needed to be accompanied by a chaperon while touring and after her set, she had been sleeping with her head on her chaperon's lap (an older female family friend). Cosby interpreted their interaction as "lesbian" and is alleged to have warned other television shows that Ian was "not suitable family entertainment" and "shouldn't be on television" because of her sexuality, thus attempting to blacklist her. Although Ian would later come out as lesbian, she states that at the time of the encounter with Cosby she had only been kissed once, in broad daylight at summer camp. "Society's Child" stigmatized Ian as a one-hit wonder until her most successful US single, "At Seventeen", was released in 1975. "At Seventeen" is a bittersweet commentary on adolescent cruelty, the illusion of popularity and teenage angst, as reflected upon from the perspective of a 24-year-old. The song was a major hit as it charted at #3 on the Billboard Hot 100, hit #1 on the Adult Contemporary chart and won the 1976 Grammy Award for Best Pop Vocal Performance - Female, beating out Linda Ronstadt, Olivia Newton-John and Helen Reddy. Ian appeared as a musical guest on the series premiere of Saturday Night Live on October 11, 1975, performing "At Seventeen" and "In the Winter". The album, Between the Lines, was also a smash and reached #1 on Billboard's album chart. The album would be certified platinum for sales of over one million copies sold in the US. Another measure of her success is anecdotal: on Valentine's Day 1977, Ian received 461 valentine cards, having indicated in the lyrics to "At Seventeen" that she never received one as a teenager. "Fly Too High" (1979), produced by disco producer Giorgio Moroder, was Ian's contribution to the soundtrack of the Jodie Foster film Foxes and was also featured on Ian's 1979 album Night Rains. It also became her first international hit, reaching #1 in many countries, including South Africa, Belgium, Australia, Israel and the Netherlands, and going gold or platinum in those countries as well as charting in the UK. Another country where Ian has achieved a high level of popularity is Japan: Ian had two Top 10 singles on the Japanese Oricon charts, "Love Is Blind" in 1976 and "You Are Love" in 1980. Ian's 1976 album Aftertones also topped Oricon's album chart in October 1976. "You Are Love (Toujours Gai Mon Cher)" is the theme song of Kinji Fukasaku's 1980 movie Virus. She cut several other singles specifically for the Japanese market, including 1998's "The Last Great Place". In the US, Ian did not chart in the Top 40 on the pop charts after "At Seventeen", though she had several songs reach the Adult Contemporary singles chart through 1980 (all failing to make the Top 20). Ian started "Rude Girl Records, Inc. and its publishing arm, Rude Girl Pub., January 2, 1992". "From 1992 to the present, RGR has steadily grown, with its current ownership of Janis Ian masters up to twenty albums and DVD's overseas, and a slightly smaller number in North America. The Rude Girl label oversees the production of Janis' newer work, and in the case of older work, its re-mastering and the re-creation of the original artwork." From 1982–92, Ian continued to write songs, often in collaboration with then-songwriting partner Kye Fleming, which have been covered by Amy Grant, Bette Midler, Marti Jones and other artists. She released Breaking Silence in 1993 and also came out as a lesbian. The album, Folk Is The New Black, was released jointly by her Rude Girl Records label and the Cooking Vinyl labels in 2006, her first in more than two decades. Other artists have recorded Ian's compositions, including Roberta Flack, who had a hit in 1973 with Ian's song "Jesse". Ian's own version is included on the 1974 album Stars (the title song of which has also been oft-covered, including versions by Joan Baez, Shirley Bassey, Cher, Nina Simone and Barbara Cook). Richard Barone recorded Ian's song Sweet Misery on his album Sorrows & Promises: Greenwich Village in the 1960s in 2016. She continues to tour in both the US and the UK. Ian is an outspoken critic of the Recording Industry Association of America (RIAA), which she sees as acting against the interests of musicians and consumers. As such, she has released several of her songs for free download from her website. "I've been surprised at how few people are willing to get annoyed with me over it," she laughs. "There was a little backlash here and there. I was scheduled to appear on a panel somewhere and somebody from a record company said if I was there they would boycott it. But that's been pretty much it. In general, the entire reaction has been favorable. I hear from a lot of people in my industry who don't want to be quoted, but say 'yeah, we're aware of this and we'd like to see a change too.'" Along with science fiction authors Eric Flint and Cory Doctorow, she has argued that their experience provides conclusive evidence that free downloads dramatically increased hard-copy sales, contrary to the claims of RIAA and NARAS. Ian writes science fiction. A long-time reader of the genre, she became involved in science fiction fandom in 2001 by attending the Millennium Philcon. Her short stories have been published in anthologies and she co-edited, with Mike Resnick, the anthology Stars: Original Stories Based on the Songs of Janis Ian, published in 2003 (ISBN 978-0-7564-0177-1). She continues to occasionally attend science fiction conventions. Ian has been a regular columnist for the LGBT news magazine The Advocate and contributed to Performing Songwriter magazine from 1995–2003. On July 24, 2008, Ian released her positively-received autobiography Society's Child (published by Penguin Tarcher) . An accompanying double CD, The Autobiography Collection, has been released with many of Ian's best loved songs. Ian took acting lessons from renowned coach Stella Adler in the early 1980s to help her feel more comfortable on stage, and she and Adler remained close friends for the rest of Adler's life. In December 2015, Ian appeared in the series finale of HBO comedy series Getting On playing a patient who refused to stop singing. Ian's mother, Pearl Fink, was diagnosed with multiple sclerosis in 1975. Because of this, Ian and her brother convinced their mother to pursue her lifelong dream of going to college. Fink eventually enrolled in Goddard College's adult education program and ultimately graduated with a master's degree. After Fink's death, Ian decided to auction off memorabilia to raise money to endow a scholarship at Goddard specifically for older continuing education students, which became the Pearl Foundation, a 501(c)(3) public charity. At the end of each year, 90% or more of funds raised from sale of merchandise, donations from fans and contributions from Ian herself are disbursed to various educational institutions to fund scholarships. By 2016, it had contributed over $900,000 in scholarship funds. On October 23, 2011, Ian performed with Ryan Adams and Neil Finn on BBC Four's Series 2 Episode 4 of the series, Songwriters' Circle. The night resulted in controversy, ending with an awkward exchange between the performers when there seemingly was confusion between the songwriters about who was to perform and join in on each other's songs. Strictly Solo (2014) (Rude Girl) Available only at live shows. ^ "Janis Ian: A Life in Song" (PDF). Janis Ian Website. 2006. Archived from the original (PDF) on May 7, 2007. Retrieved 2007-06-09. ^ a b c Ankeny, Jason (2003). Bogdanov, Vladimir; Woodstra, Chris; Erlewine, Stephen Thomas, eds. All Music Guide to the Blues: The Definitive Guide to the Blues. Backbeat Books. ISBN 0-87930-736-6. ^ Nash, Margo. "JERSEY FOOTLIGHTS", The New York Times, March 16, 2003; accessed December 19, 2007. "Yet when Janis Ian went to East Orange High School, she was kicked out of the chorus." ^ Silman, Anna (Jul 29, 2015). "Janis Ian says Bill Cosby allegedly spread lesbian rumors about her as a teen, tried to blacklist her from TV". Salon. Retrieved 29 July 2015. ^ Jones, Nate (Jul 29, 2015). "Janis Ian Shares Her Own Creepy Bill Cosby Story". Vulture. Retrieved 29 July 2015. ^ Goodman, Jessica. "Janis Ian recalls personal story about Bill Cosby following New York cover feature" (July 29, 2015). Entertainment Weekly. Retrieved 29 July 2015. ^ Wiser, Carl. "Janis Ian interview (March 14, 2003)". Songfacts. Retrieved September 27, 2012. ^ Cader, Michael; Baskin, Edie (1994). Saturday Night Live: The First Twenty Years. Houghton Mifflin Harcourt. pp. 124–127. ISBN 0-395-70895-8. ^ "SNL Transcripts". Snltranscripts.jt.org. Retrieved February 28, 2016. ^ Rees, Dafydd; Luke Crampton (1996). Encyclopedia of Rock Stars. Dk Pub. ISBN 0-7894-1263-2. ^ "Rude Girl Records, Inc.". janisian.com. Retrieved September 8, 2016. ^ a b c Keehnen, Owen (March 24, 2005). "At 42: Lesbian Legend Janis Ian Comes Out". Queer Culture Center. Retrieved November 15, 2012. ^ Wilson, David Bertrand. "Trying The Patience Of: Janis Ian". Wilson & Alroy's Record Reviews. Retrieved September 10, 2013. 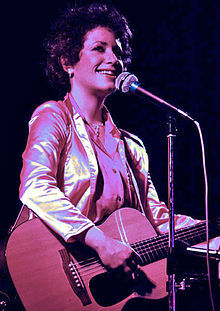 ^ "Janis Ian: On Tour". janisian.com. Retrieved January 20, 2014. ^ Ian, Janis (May 2002). "The Internet Debacle – An Alternative View". Performing Songwriter Magazine. Archived from the original on May 9, 2007. Retrieved 2007-06-09. ^ Vanderhorst, Jan (October 2002). "Janis Ian: Doing It From The Heart". Retrieved 2007-06-09. ^ John Teehan. "Janis at Worldcon 2001". Sff.net. Archived from the original on October 4, 2013. Retrieved 2013-12-05. ^ Ian, Janis. "Janis Ian - American songwriter, singer, musician, author and multiple Grammy-winning writer of "At 17," "Jesse" and "Society's Child": Listening Room: Best Of Janis Ian: The Autobiography Collection". www.janisian.com. Retrieved 2017-01-20. ^ Lambe, Stacy (14 December 2015). "'Getting On' Creators on Taking Big Swings With the Series Finale". ET Online. Retrieved 21 February 2016. ^ ""Getting On" from the HBO series "Getting On"". Janis Ian Shopping Mall. Retrieved 21 February 2016. ^ a b Ian, Janis. 2008. Society's Child: My Autobiography. New York City: Tarcher. ^ "Ian profile". Glbtq.com. Archived from the original on October 18, 2014. Retrieved 2013-12-05. ^ "Pearl Foundation". Retrieved 2017-01-25. ^ Marcus Teague. "Ryan Adams and Neil Finn fall out during TV taping". ^ "ジャニス・イアンとの夢のコラボ曲「Every Woman's Song」が 着うた(R)、着うたフル(R)で好評配信中！" [Janis Ian dream collabo song, "Every Woman's Song" out as a ringtone and a cellphone download!] (in Japanese). Sony Music Japan. September 1, 2010. Archived from the original on May 31, 2014. Retrieved June 1, 2014. ^ "Japan Billboard Hot 100 2010/09/20". Billboard (in Japanese). September 20, 2009. Retrieved March 5, 2014.